This geothermal water-water option requires a minimum water amount which depends on building size and is calculated by the commissioned installer. Water temperature should not be below 6°C. 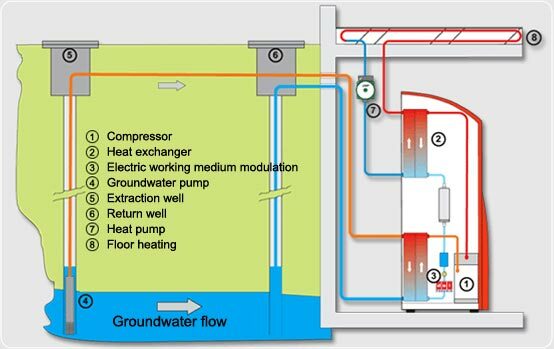 The water is transmitted from the supply well to the heat pump from where it is delivered to a discharge well or an absorbing well in about 15 metres’ distance. By means of the heat pump, the free environmental energy is converted into high-quality thermal energy.